It is very important that the base for our log cabins is correct. If it is not we may not be able to build the log cabin. You will receive a Base Information Sheet with your order confirmation which will tell you the correct size base for your log cabin. Always check the diagonal measurements of your base to make sure it is square. Your log cabin base can be larger than this but no smaller. However, it is best to do it to the recommended size to help stop water collecting on the base. The base must be above ground level. You must not fit paving or decking etc. right up to the cabin if it will be higher than the base. This is to allow water to drain away. A channel filled with gravel around the cabin base can look decorative and is an effect soak-away. Make sure there are no plants, raised beds, walls, fences or trees in the way. 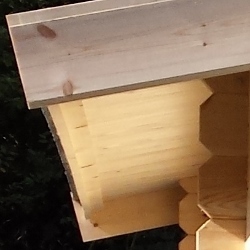 This space is required at the top and bottom of log cabins for the log ends, roof overhangs and access. The base for logs cabins needs to be perfectly flat. It should not slope to allow water to run off. Your base needs to be perfectly level with no lumps or dip. Concrete must be finished smooth, not rippled, with no edging finish at a different level. The shuttering must be removed before we arrive. The best materials for your log cabin base are concrete or concrete flagstones. Other materials such as paving, decking or timber frames may be OK as long as they are flat, level, solid and the right size but please ask for advice because it may affect the way we prepare the log cabin. Soil, grass or gravel are not suitable for a log cabin base. Please contact us using the contact form or call 01270 628261 if you have any questions about log cabins and your base.